Given how long it took Mad Max: Fury Road to get to the big screen, it could almost be considered a miracle that it arrived at all, let alone became the best-reviewed movie of 2015. The post-apocalyptic adventure is riding a wave of Oscar buzz going into the nominations announced later this week, with many fans wondering when a follow-up might happen. 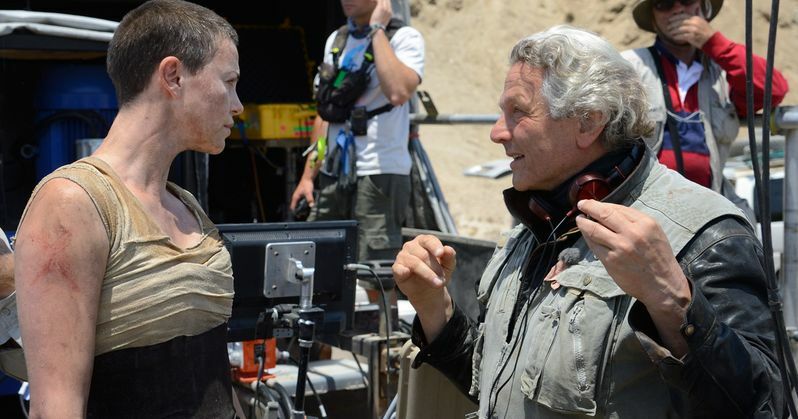 Director George Miller has said numerous times that he wants to make a smaller film before revisiting this big-budget landscape, even hinting last week about making a Furiosa origin movie after this unspecified smaller film and Mad Max 5. Today, however, we have a new report from Page Six, where the director now says he's done with the entire franchise. "I won't make more Mad Max movies. Fury Road was forever getting completed. If you finish one in a year, it's considered a leap of faith. Start, stop, start again. I've shot in Australia in a field of wild flowers and flat red earth when it rained heavily forever. We had to wait 18 months and every return to the US was 27 hours. Those Mad Maxes take forever. I won't do those anymore." The director's comments are a rather stark reversal from his previous stance, where he has always said he wants to return to this apocalyptic landscape after he makes a smaller film that is less demanding. Since it took roughly 15 years to get Mad Max: Fury Road off the ground, it's certainly possible that the 70-year-old director changed his mind, but we know he does have two scripts completed for potential sequels, which he wrote during the production delays on Mad Max: Fury Road. During another interview with Studio 360, the filmmaker said that he would like to revisit this world again, while also hinting that he could pass the franchise off to a younger director. "What happened to Max after Fury Road? What happened before Fury Road? What happened to the other characters? Those stories are there - probably not as the next film but the film after. I'd like to do one of them. We'll see. As John Lennon said, life is what happens when you're making other plans. There are so many other directors out there. People are directing younger and younger. They're getting a real sense of cinema very, very early. There are some great directors out there." Mad Max: Fury Road originally took shape in the early 2000s, when Mel Gibson was still being eyed to come back as Max Rockatansky from the first three movies, Mad Max, Mad Max 2: The Road Warrior and Mad Max Beyond Thunderdome. When the project was reworked with Tom Hardy as Max and Charlize Theron as Furiosa, it took a whopping three years to complete production. What do you think about George Miller's comments on leaving the franchise he built?